Today we lost Harold Ramis, one of the most successful comedy writers and directors of our time who gave us classics like "Caddyshack," "Groundhog Day" and "Stripes." He's also responsible for introducing three of the most popular movie cars into the pop culture universe. Ramis died early Monday morning. The 69-year-old Chicago native suffered complications of autoimmune inflammatory vasculitis. His impact on entertainment is immeasurable, from his early work on "SCTV" to his big break co-writing "National Lampoon's Animal House." 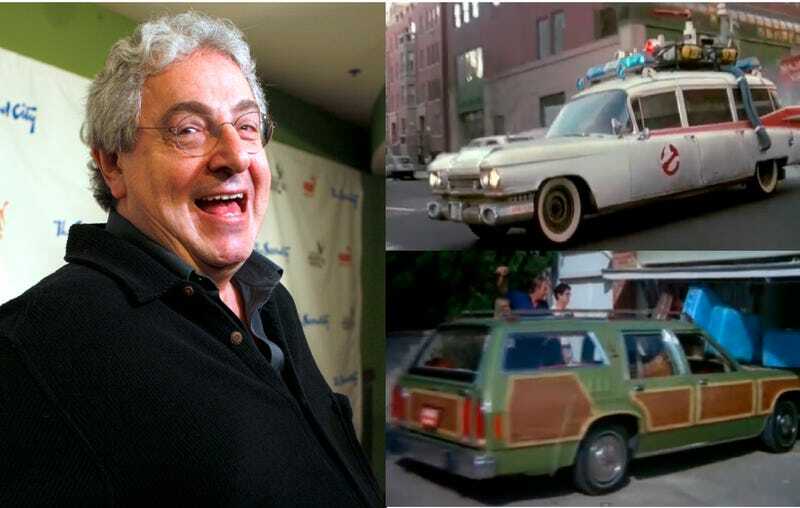 We could talk all day about Ramis' near-flawless resume, but let's take a moment to honor three of the most famous cars from movies he's written and/or directed: The Wagon Queen Family Truckster from "National Lampoon's Vacation"; the Ecto-1 from "Ghostbusters"; and the EM-50 Urban Assault Vehicle in "Stripes." All were based on a Ford LTD Country Squire Wagon and designed by "King of Kustomizers" George Barris, the man behind the original Batmobile. The car was designed by George Barris and was deliberately designed in bad taste as a ridiculous station wagon, with absurdly over-the-top styling. The Truckster features overdone wood paneling, eight headlights (four on each side in a rectangular cluster) taken from another Crown Victoria/Country Squire but inverted, a grille area largely covered by bodywork having only two small openings close to the bumper, a separate oil cooler grille, large chrome hubcaps with a huge crown logo, and a badly-placed gas tank access door (in the front passenger fender). Only one of the five original wagons survive today and wasn't even used in the movie and was sold at a Mecum auction in Houston, which is slightly devastating if you think about it. The Ecto-1 ambulance from "Ghostbusters" has a sadder story. You might remember that one of the three Cadillac ambulances converted for the movie was headed to a scrap yard before loyal fans of the franchise stepped in to rescue it. Dan Aykroyd's original Ectomobile was an all-black, rather sinister-looking machine with flashing white and purple strobe lights that gave it a strange, ultraviolet aura. Though kept essentially intact through all the drafts, the vehicle concept — suggesting a hearse rather more than an ambulance — was clearly more keeping with the darker tone of Aykroyd's first draft than with lighter ones that followed. Working with a basic 1959 Cadillac ambulance, hardware consultant Steven Dane designed and modified the final vehicle. Although a second backup vehicle was procured as a hedge against maintenance problems, only the primary ambulance was fully converted. In the end, the backup was used solely for early 'premodification' scenes. A bright-colored vehicle was used, producers say, because most of the film took place at night, and a black vehicle wouldn't have had the same effect. Out of the three Ectomobiles, one was fully restored, the second one's whereabouts are unknown and the last remaining Ecto-1 was subject to damage by ravenous fans, being hit by another vehicle and a smashed windshield leaving the interior open to the elements. There hasn't been any update on whether restorations to the last one are complete. Finally, there's the EM-50 Urban Assault Vehicle from "Stripes," whose history and current location is a little harder to track down. Here's what we know for sure: It was built from a 1973-1978-era GMC Motorhome. No one seems to know what model year it was, and because Motorhomes are still around today, there are a few replicas running around. Maybe it's in Bill Murray's garage.